Most commercial flat roofs use BUR (built-up roofing) in their installation. Formerly known as tar and gravel roofing, BUR has been around for over a century. Installed correctly, BUR is long lasting and extremely water resistant. Intelligent Design gives you the essential guide on BUR material. Built-up Roofing (BUR) is a frequent choice when dealing with a flat or low slope roof. By design, a commercial BUR is highly waterproof. A built-up roof has several layers including a membrane, tar, and felt. By building up several of these layers, we create a long-lasting and durable roof for your commercial application. What are the Benefits of BUR? A commercial BUR provides excellent protection from the elements, including being waterproof and UV resistant. The layers within BUR, known as ply sheets, have fiberglass and other rigid insulation as reinforcement. This technology improves energy efficiency and lowers the utility bill on your commercial building. BUR is virtually maintenance free. This type of roof is very long lasting and durable, so you get a long life for your roofing dollar. Unfortunately, the installation of commercial BUR is very labor intensive. This causes the installation costs to be higher than shingle or metal roofing. However, the high cost of the installation is offset by the longevity of the product. A commercial BUR may be labor intensive and cause vapors during installation, but lasts several decades. With a roofing type that has been around for 100 years, BUR has made many technological advances. The types of materials used in the layers have improved. Now a BUR can have high waterproofing and high insulative qualities. As the industry improves, it now offers modified bitumen asphalt-based roofing that we can apply with a cold process rather than the dangerous hot tar used in traditional BUR roofs. 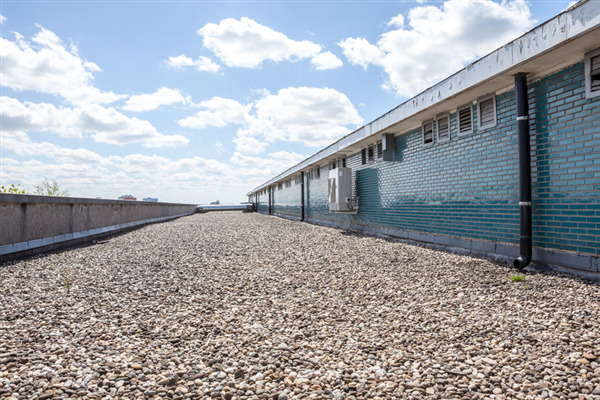 A modified bitumen roof now has self-adhering sheets available to ease installation time. This sheet installs quicker than normal BUR roofing sheets and lowers the labor cost of a BUR roof. The modified bitumen roof also is completely free of VOC (volatile organic chemicals), so it is safer for installation. The future of BUR with modified bitumen layers and reduced installation times is bringing costs down for this roof type. For new installation or repair of your commercial roofing, look to the experts at Intelligent Design. We have solutions at every price point for your new roof or roof replacement. Let the professionals we have on staff design a custom roofing solution for your property. For more information, give us a call at 763-315-0745, or you can message us on our contact page. Is Your Commercial Roof a Liability?